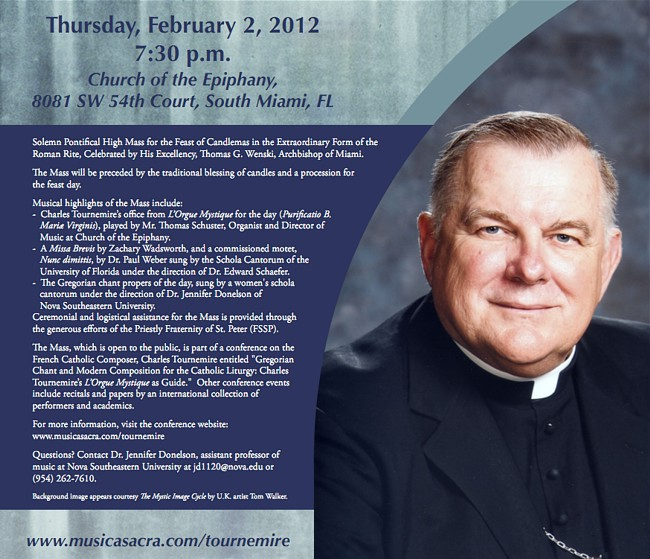 On Thursday February 2nd, at 7:30 PM EST His Grace Archbishop Thomas Wenski will celebrate a Pontifical Solemn High Mass for the feast of Candlemas at the Church of the Epiphany, Miami, Florida. The Liturgy will include the distribution of candles for the Feast, as well as a procession of the clerics around the interior of the church. The assistant clerics will be Very Rev. Msgr. A. Wadsworth (Westminster, England), Rev. Fr. Guy Nicholls (Birmingham Oratory), Rev. Fr. R. Vigoa, Very Rev. Fr. C. Marino, Rev. Fr. J. Fishwick and Very Rev. Msgr. J. O’Doherty (Archdiocese of Miami), Rev. Fr. C. Saenz (Society of Jesus), Rev. Fr. J. Fryar, Rev. Fr. J. Nolan and Rev. Fr. B Austin (Priestly Fraternity of St. Peter). The Florida Schola Cantorum, under the direction of Rev. Dr. Edward Schaefer will sing Wadsworth’s Missa Brevis, and the Women’s Schola Cantorum will sing the Gregorian Chant propers for the Mass and Terce, under the direction of Dr. Jennifer Donelson. The Pontifical Mass will broadcast on www.LiveMass.net, and also on iMass (app for iOS devices) LIVE, starting at 7:30 PM EST. Rev. Fr. 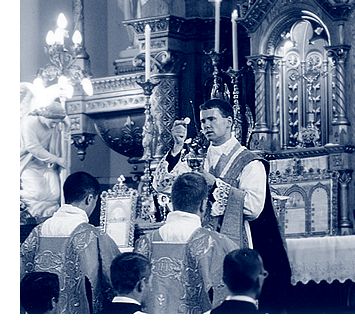 C. Goodwin FSSP will be joining us as commentator for this Liturgy.